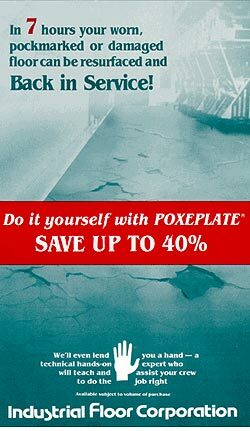 Epoxy Material Unit Sales for "Self-Installation"
Now is the time to resurface your worn or damaged floor with POXEPLATE® for a floor stronger than concrete and resistant to shock, abrasion, solvents, acids, alkalies and oils. You know your plant's floor has seen better days. You know that a worn or damaged floor is not just unsightly, it's demotivating to employees and visitors alike. It requires more effort to keep clean. It may be dangerous and cause serious and expensive accidents. But, you say, complete floor replacement is too expensive, may require air compressors and jack hammers to remove it and too much expensive downtime. This extra work is usually not necessary with POXEPLATE® EPOXY FLOORS. A completely new floor surface consisting of several thousand square feet can be completed, cured and returned to use either during your regular working hours, weekends, nights or other off hour periods. Most major installations can be and usually are performed during a weekend and are ready for full use on Monday morning. 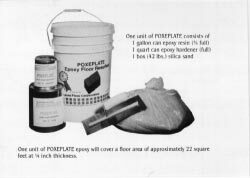 POXEPLATE® is a two component 100% solids epoxy, containing no solvents. It is formulated with dehydrated specially graded silica to form a workable matrix that is applied over a concrete or wood floor at an average thickness of 1/4" and trowelled to a smooth or slip-proof finish. The cost of a POXEPLATE® EPOXY FLOOR is far less than most other types of floor installations and the qualities offered substantially exceed those offered by ordinary concrete. POXEPLATE® applied at the standard thickness has a much greater compressive strength than concrete and will withstand forklift activity, heavy abrasion and chemical spillage. Complete directions are supplied on the can. In addition, you may call to discuss your problem with our technical staff at any time. If the size of your installation warrants, we'll send a technical hands-on expert to your site to teach and assist your crew with your installation. We'll even lend you our special mixing machine on larger jobs.